— At the start of the episode, we learn that the new school term has begun, but Mai is nowhere to be found. 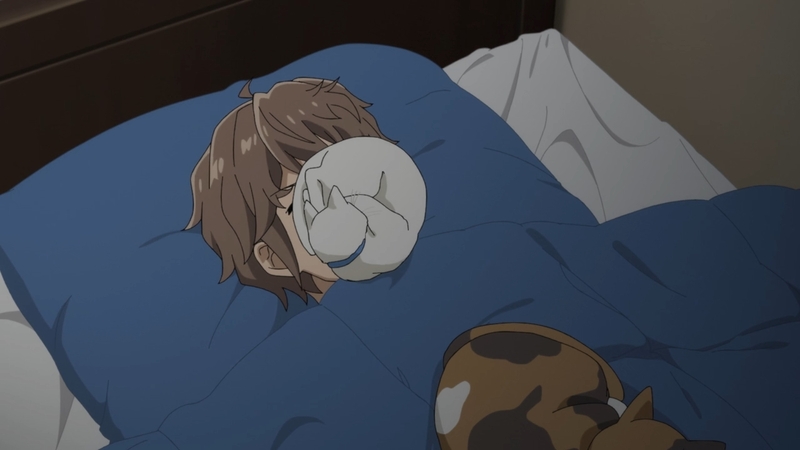 Not only that, this comes as a surprise to Sakuta. Okay, I understand that he doesn’t have a cellphone, so she can’t exactly text him. But does the guy not have a computer either? Can she not email him? Can she not let him know ahead of time that she won’t show up to school? Some aspects of this show are just really hard to swallow. 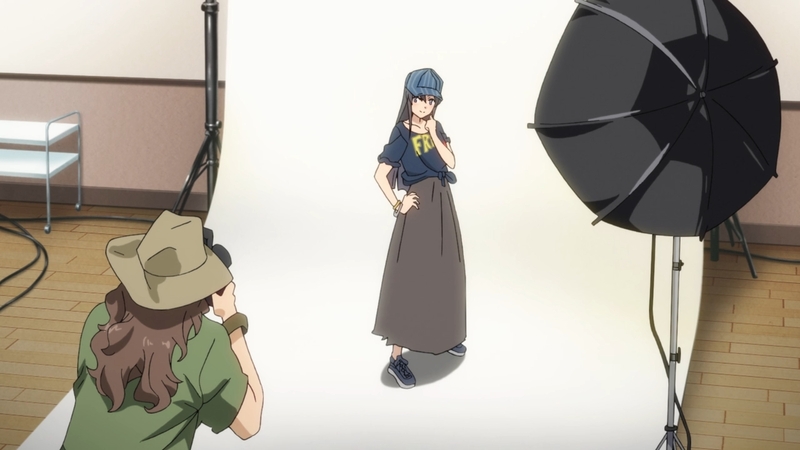 — When Sakuta gets to Mai’s apartment, he sees the girl out on the streets. Naturally, he calls out to her, but she doesn’t recognize him at all. That’s when a blonde girl walks up and steps on his foot. Guess what? She’s Mai. What does this mean? Well, the two sisters have somehow swapped bodies. 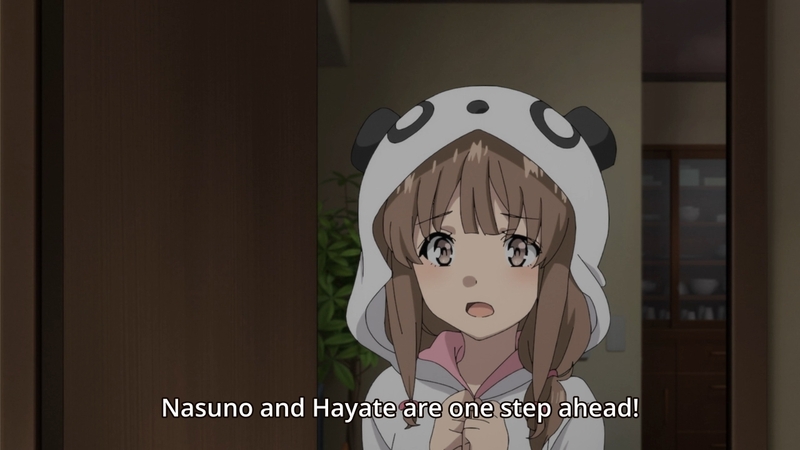 Again, why wouldn’t she warn Sakuta ahead of time? Why wouldn’t she give him a heads up? Is she physically unable to? — Apparently, Mai has an entire apartment all to herself. Well, I guess she’s pretty rich since she’s a star. — Anyways, the girl ran away from home, came to her big sis’s place, then the body swap thing happened. Is it because she wishes she could be as independent as Mai? Nah, that would be too predictable. — Mai tells her sister that they will just have to make do for now, i.e. live each other’s lives. Another reason why I would never choose the life of show business. If I ever need to take some personal time, I just do so. But I guess a famous actress or an idol would have far too many obligations to fulfill. 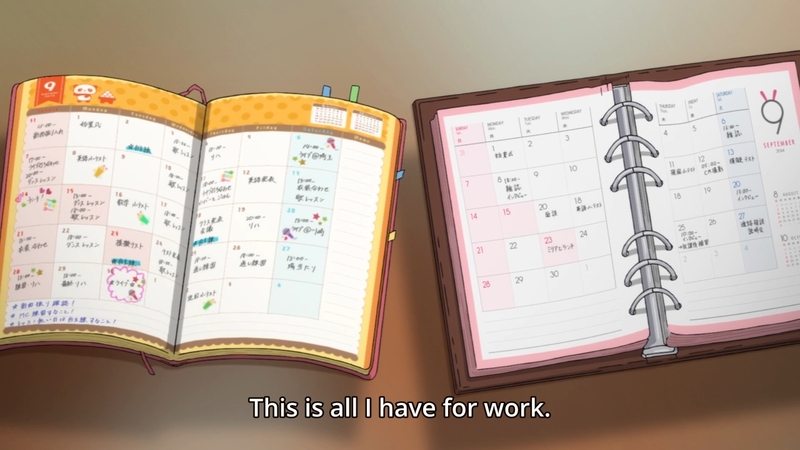 — Well, it turns out Nodoka’s schedule is packed, so Mai will be pretty busy… again. 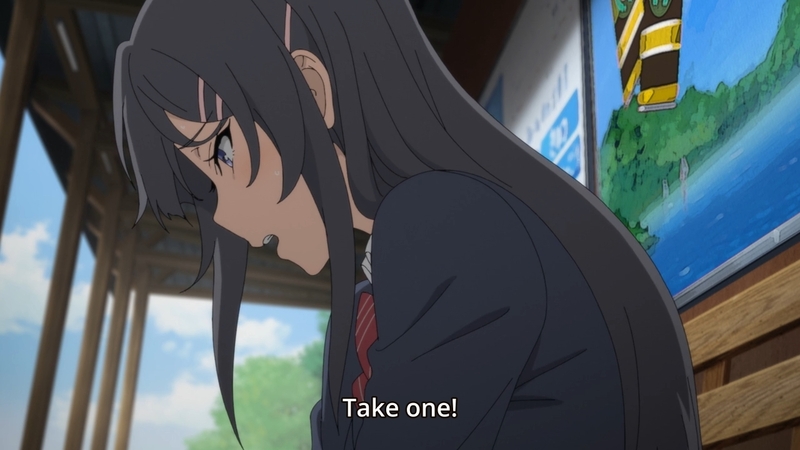 So far, it looks like Sakuta might be spending a lot of 1-on-1 time with the imouto. Mai even asks him to walk Nodoka to school. Sigh. 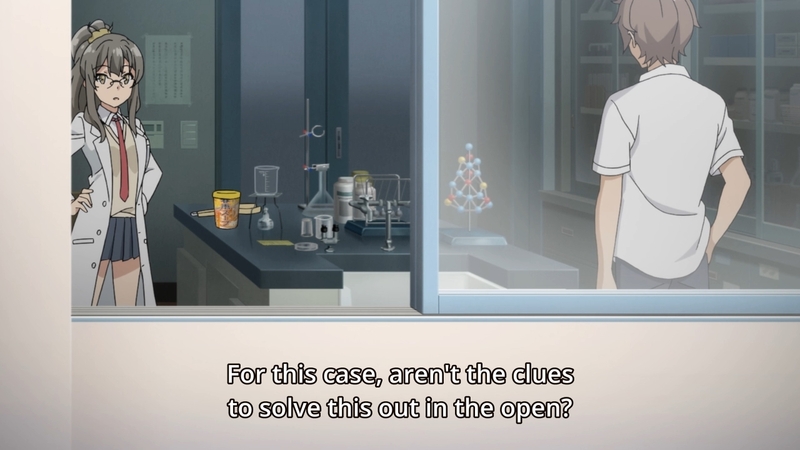 Detective/Therapist Sakuta to the rescue. — Luckily, Nodoka doesn’t have to worry about fitting in with Mai’s friends. — Both sisters don’t have friends, so they might be pretty similar even though they don’t even live in the same household. Maybe they’ve swapped bodies because Nodoka thinks Mai has it better than her. Maybe she has an inferiority complex. 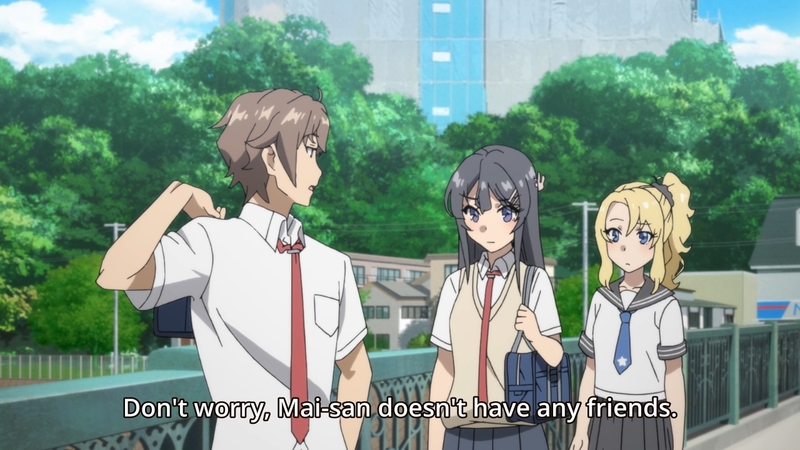 Mai even reveals to her boyfriend that their mothers have been engaged in some sort of proxy war. Ah, parents living vicariously through their kids. Few things in life are more pathetic than that. — I’m sure Sakuta will run to Rio at some point and ask for advice. I just wonder what silly scientific or philosophical concept gets roped in this time. 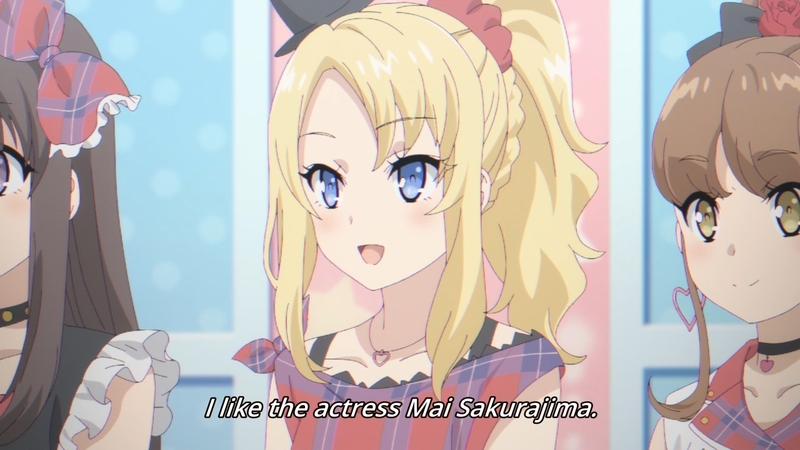 — Sakuta wonders if it’s okay for Mai to just board a train on her own in an idol’s body, but apparently, Nodoka isn’t very famous. Looking more and more like lil’ sis is a bit envious. If you look up to someone that much, you might as well become them. The problem is that she’s probably too ashamed to admit this. Or maybe she even hates herself or letting it get this far. It’s hard to go from idolizing someone to hating them, especially if they’re family. — Sweet, it’s kooky philosophy time. — Aw, lame. Rio simply tells Sakuta that all Nodoka would have to do is become famous. Well, obviously it’s not that easy. — If an inferiority complex is truly the culprit, then Nodoka needs to attend her mental health. In other words, she needs a therapist. Unfortunately, that would make too much sense. So instead, we’ll have her sister’s boyfriend play the therapist. — In the meantime, Sakuta continues to say more inappropriate things, especially to a girl who hardly knows him. — So while relaxing on the beach, Sakuta manages to hit a nerve. Nodoka can deny it, but we know it’s true. Looks like Sakuta is moving quick, though. Maybe we’ll get lucky. Maybe Nodoka’s story will wrap itself up in a single episode. Well, probably not. Like Rio, it’ll probably take two episodes. — Afterwards, Nodoka suddenly tells Sakuta that she doesn’t have the guts to face her sister. As a result, yet another girl wants to sleep overnight at this guy’s house. Hilarious. — Well, Mai is nearby anyways, so the truth comes out. 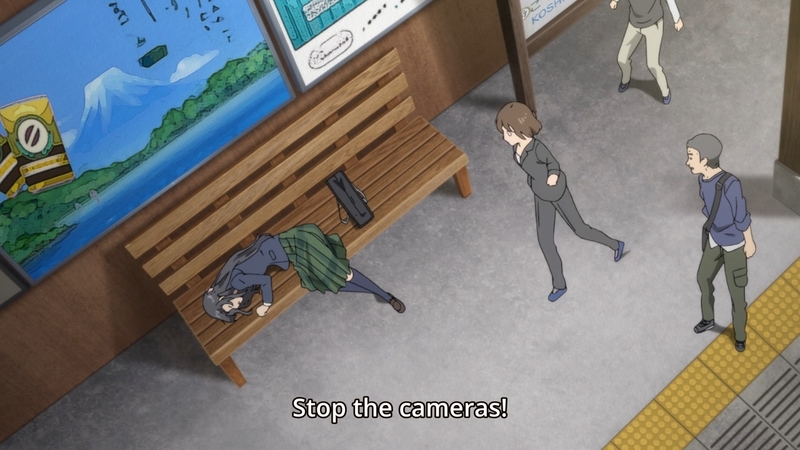 Nodoka’s mother gets on her case because Mai is more famous. Everything was fine when Mai took her break from show business, but when she came back, Nodoka’s mother became a nightmare again. — I’ll just be honest: the girl needs to stop being so entitled. 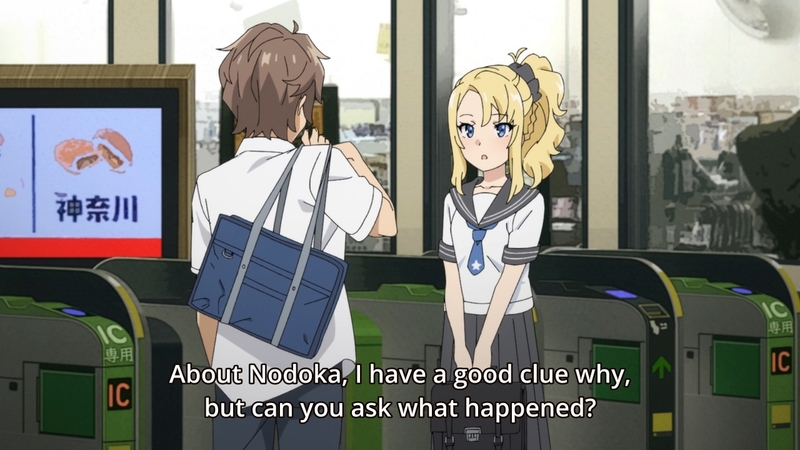 It’s really difficult for me to empathize with someone like Nodoka. Look, she already belongs to a small and very exclusive group. After all, most of us don’t have the chops to become idols. Most of us can’t dance that well, sing that well, or hell, just even be attractive enough to be interviewed on TV. C’mon, the girl needs to get a grip. She already lives a very privileged life. — This is perfect, actually. 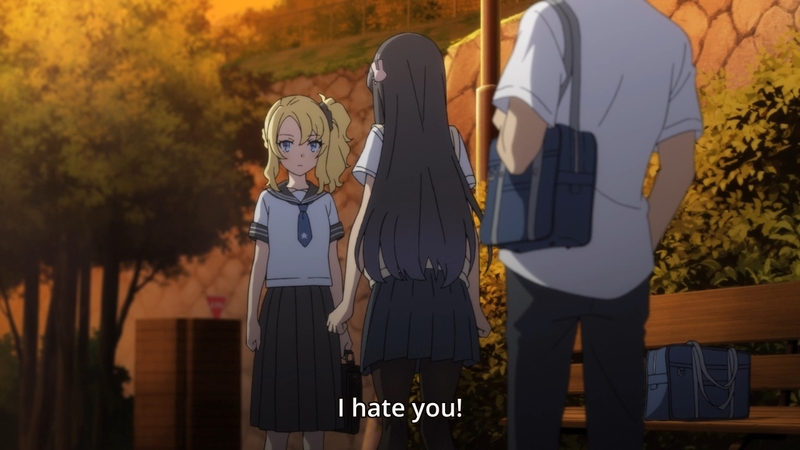 Since this is a show all about emotional teen problems, nothing could exemplify this more than one rich and famous girl being envious of another one. The cherry on top is the fact that they’re related. — Of course, I understand that she can’t help how she feels. Just because there are bigger problems in the world, this doesn’t change the fact that Nodoka feels like crap about her current situation. That’s fair. We all have our issues. But not every story deserves to be told, and frankly, this is one of them. Nodoka’s problems are real. I won’t say that they’re not. But at the same time, they’re just not very compelling. Let’s say my girlfriend dumps me and I’m heart-broken. Should I make a big dramatic story out of it? Of course not. I’d argue that the same thing applies to Nodoka. — From a broader narrative standpoint, this is what I mean when I say that this show is exhausting. If they had taken Mai’s arc and just focused on it… made it into a romantic movie, perhaps, then that would’ve been perfect by itself. Okay, maybe not perfect, but good enough. But after three straight stories about adolescent nonsense — each one being weaker than the last plus having no breaks in-between — I’m all outta fucks to give, my friends. All out of it. By the time we roll around to the fourth girl, I’m done. My emotional battery is all tapped out. Aw, your sister is more famous than you? Boo-hoo. 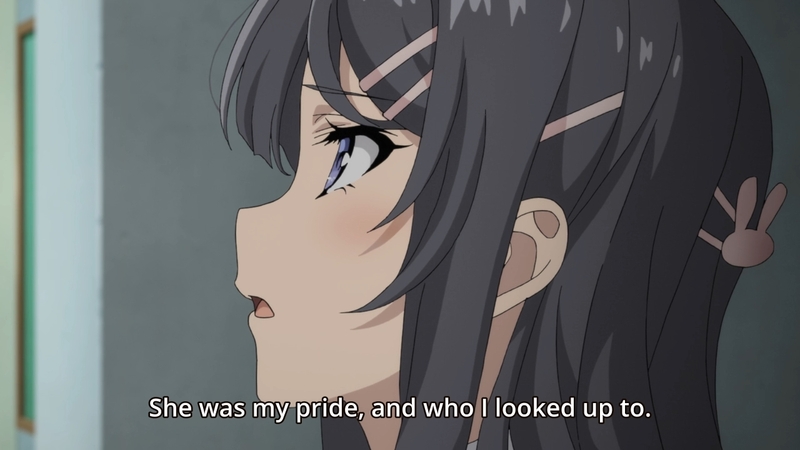 — In return, Mai also admits that she used to hate Nodoka as well. Let’s just get all of our feelings out into the open, because it sounds like our heroine has issues to work out as well. Well, nothing suggests that you can’t suffer from this adolescent nonsense more than once. — I just fear it’s going to be one of those stupid conclusions where the only thing lil’ sis wants is for her big sis to acknowledge her or whatever. Please don’t be that trite. — Instead of letting Nodoka sleep over at a stranger’s place, Mai will shack up with her boyfriend. Makes sense. Creepy imouto won’t be happy, though. — Dude, you can’t even find the time to make out with her. Let’s not get ahead of ourselves. — Next, we see a montage of the two sisters living the other person’s life while sad music plays. Looks like they’re pulling this off even if they are harboring negative feelings at the moment. For now, at least. Look, I can’t be an astrophysicist just because I want to be one. Nodoka might want to be a famous actress like Mai, but… y’know, you kinda have to take acting classes for that. — They also get to see what the other person deals with on a day-to-day basis. 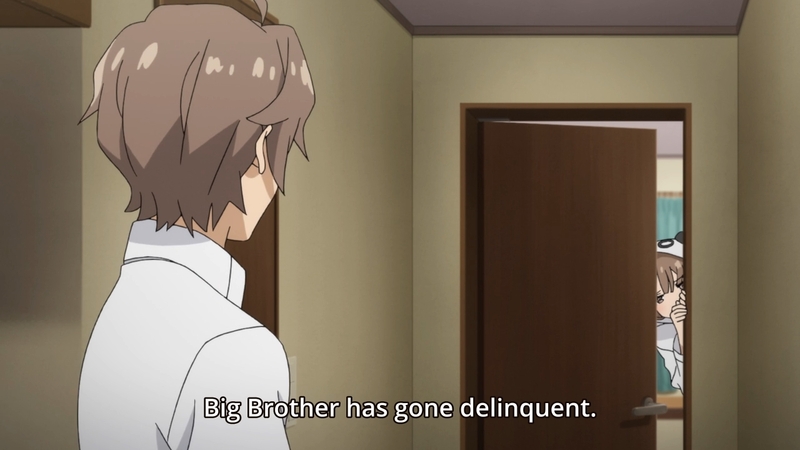 For instance, Mai now realizes that Nodoka’s mother is truly psychotic. Or y’know, one of those helicopter parents. Tomato, to-mah-to. — Those silly hats look so stupid. But I’m biased. 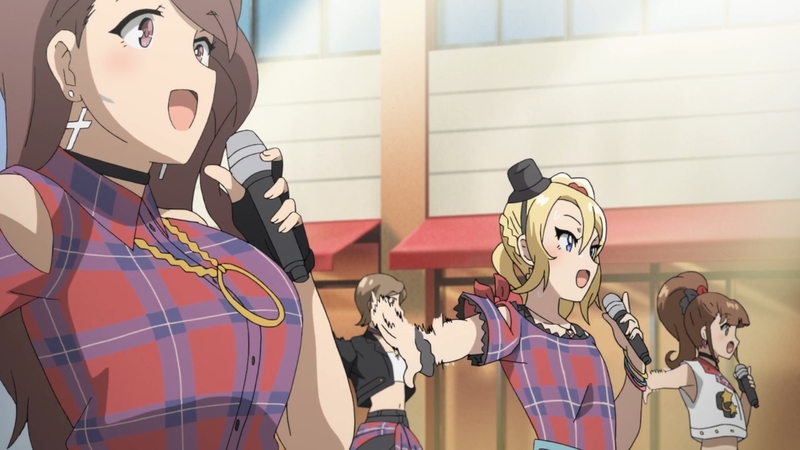 Not once have I ever found anything appealing about idols. — Meanwhile, Shoko continues to visit the cats. 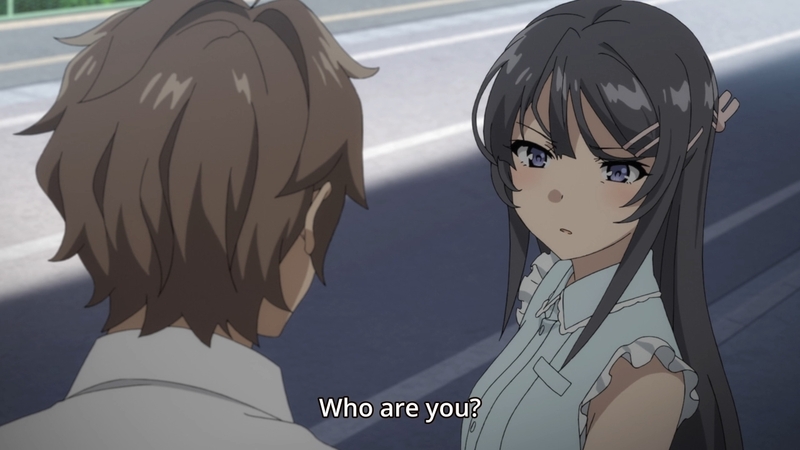 Sakuta asks if the girl has an older sister, but she says no. Dude, just accept it. You fell in love with a young girl. She probably just lost her memories at some point. — One day, Sakuta just happens to come across Nodoka working on set. What a coincidence, huh? More importantly, the girl isn’t doing so hot, but somehow, nobody notices but the hero. I imagine that the pressure has finally gotten to her. She wants to be famous like her sister, but she doesn’t recognize that her sister has put in the hard work. Sure, it helps to be born beautiful, but every actor has to hone his or her craft. An idol who has never had to act wouldn’t just be able to fit in seamlessly after studying the script. — Finally, when she starts visibly freaking out and faints, people finally come to her aid. Who needs enemies when you have such an attentive team around you? 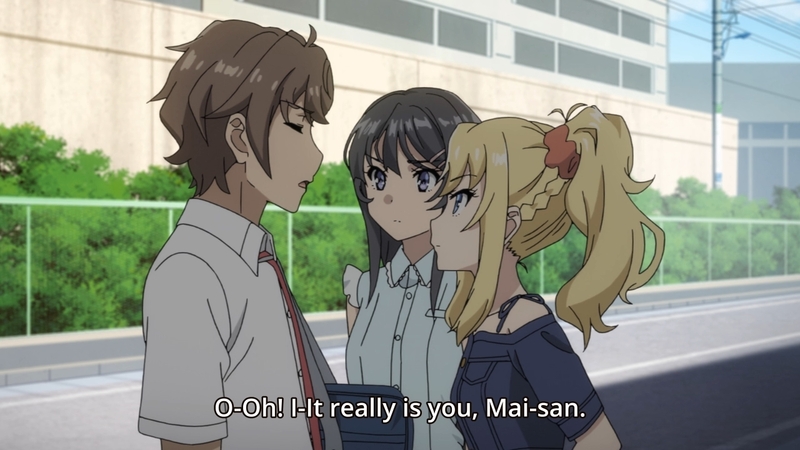 — Sadly, Sakuta doesn’t have a phone, so he can’t even message Mai and immediately tell her that her imouto is in trouble. So instead, he had to wait for her to come to him to relay the bad news. — At school, Sakuta tells Yuuma that he would like to know what it feels like to have a perfect big sister. Yuuma can’t personally relate, but his girlfriend can. — After school, the hero gets a spare key to his girlfriend’s place in order to check up on Nodoka. Mai still can’t do it herself. Yay, now she’s immature as well! 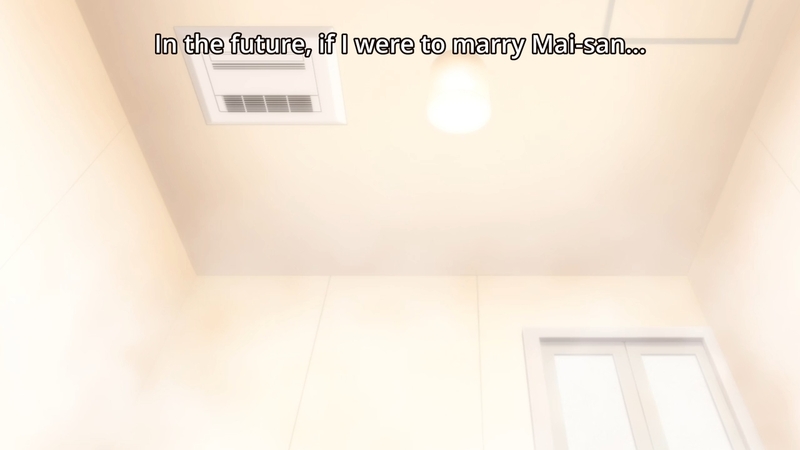 — Sure enough, when he gets up there, Nodoka asks if Mai had said anything to him about her. 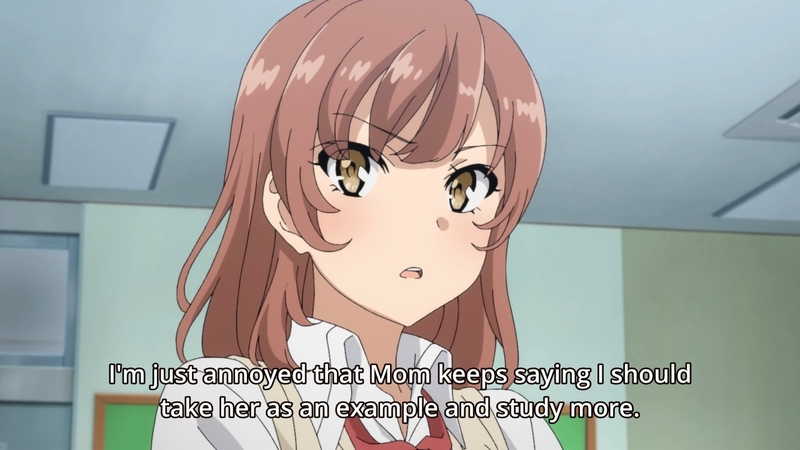 Since Mai can’t put on her big sis pants, Sakuta ends up lying and telling Nodoka that her big sister was confident in her. — Boy, imouto is such a slob. 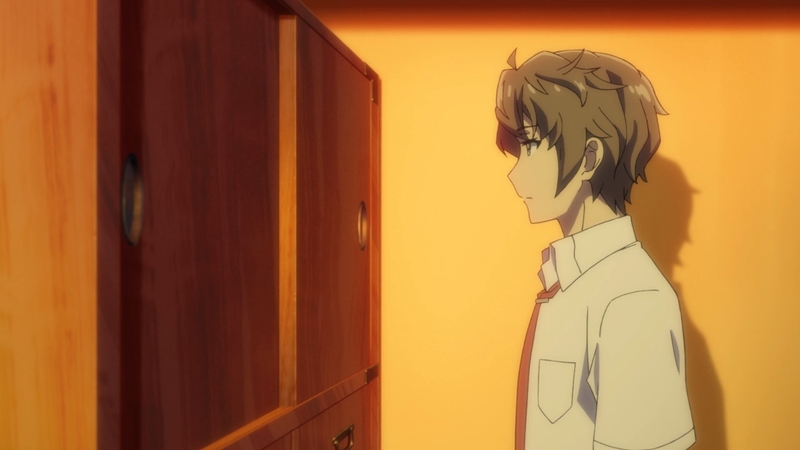 — So while Nodoka is taking a bath, the episode ends with Sakuta taking a peek at exactly what Mai told him not to look at. And of course, the ED rolls as soon as he’s about to open the damn cabinets. I guess that’s your cliffhanger. I hope there’s literally a skeleton in her closet. You heard me. Literally. 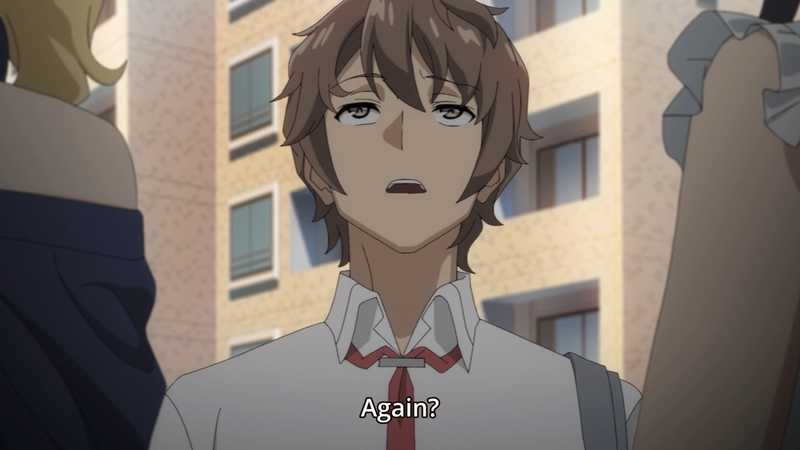 I think this will be the big sticking point of this series: That it seems to follow the same formula of “Sakuta helps girl” and that can get a little stale after awhile. Though I have to say I thought this ep put the series back on track after the kinda eh Futaba arc. I think 12 episodes will be just enough for this series (if it ends on his sister like many are predicting), but any longer and I don’t know if it’s premise has any strength. Still love it to death though. For me, Nodoka is the worst one yet. We literally just met her, and she’s dumping her emotional issues on us. At least with Tomoe and Rio, there was the conceit of getting to know them before they suffered their own adolescent whatever. 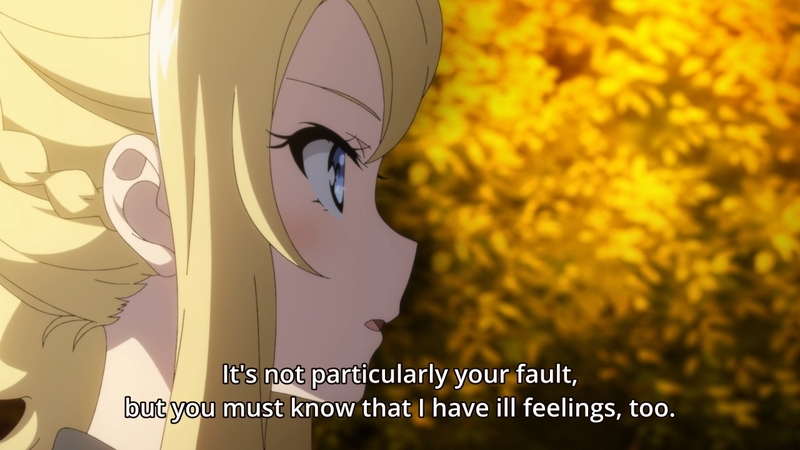 I feel no connection to the character whatsoever, so it makes it doubly difficult for me to empathize with her situation. Either the number of girls should have been cut in half, or this should have been a 2-cour adaptation. 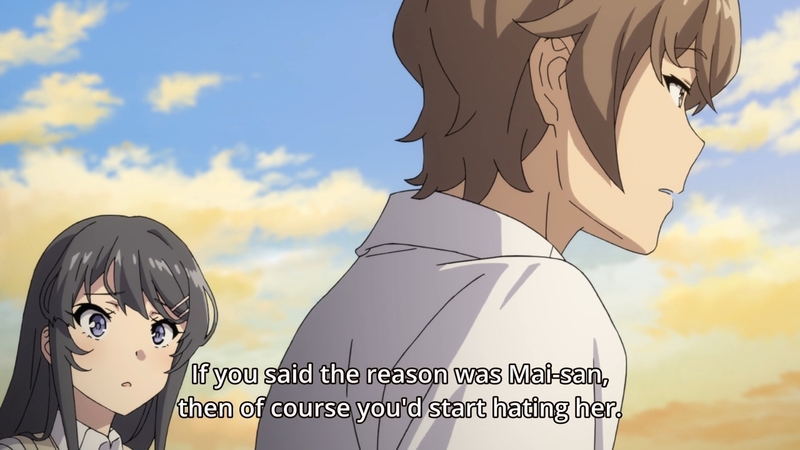 Reasonable observations, though I kinda feel this is a Mai 2.0 arc as well, just using her sister as another way to deal with her issue of “Show-biz vs Wanting to be with Sakuta” That’s what I pulled from it. Yeah, I considered that. But right now, we’re spending more time with Nodoka than Mai. True that. But for some reason, this is clicking with me a lot more than the Futaba stuff did. >But does the guy not have a computer either? Can she not email him? Can she not let him know ahead of time that she won’t show up to school? Some aspects of this show are just really hard to swallow. I’m not sure why you had an issue with this. 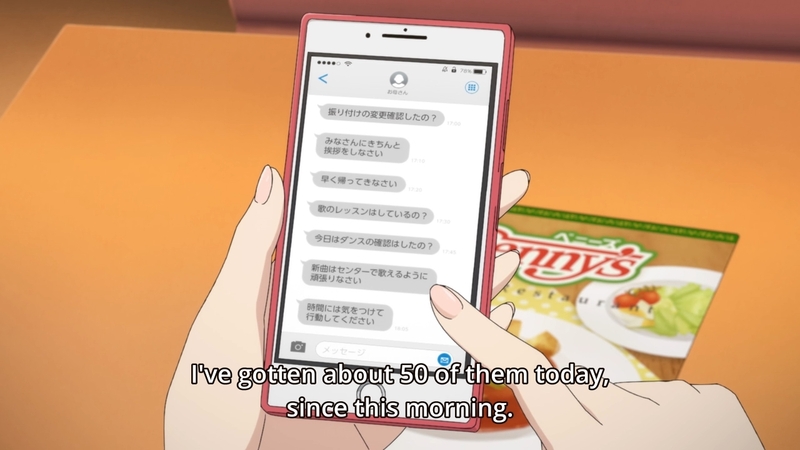 It’s not like Sakuta threw away his cellphone just because of its mobility, simple access to the internet is something he doesn’t want to participate in after everything that happened with his sister. >Again, why wouldn’t she warn Sakuta ahead of time? Why wouldn’t she give him a heads up? Is she physically unable to? There’s no way for her to do this aside from talking to him face to face, and I don’t think she’d have the time to do this when Nodoka apparently showed up at her house late in the night running away from home. >Unfortunately, that would make too much sense. So instead, we’ll have her sister’s boyfriend play the therapist. I mean, even a therapist would be weirded out if you read out the plot synopsis of Your Name and tell them that’s happening to you. >Of course, I understand that she can’t help how she feels. Just because there are bigger problems in the world, this doesn’t change the fact that Nodoka feels like crap about her current situation. That’s fair. We all have our issues. But not every story deserves to be told, and frankly, this is one of them. I was living in Iraq while we were at war with America so pretty much all situations most characters in fiction go through sound like cake to me, that doesn’t mean they’re not well written or thought out. You said this yourself: this is a show about emotional teenager problems told through exaggerated supernatural events. Them being petty through the eyes of other people is inevitable, but it’s equally as petty to complain about them being bad plot points. Just out of curiosity, how do you feel about White Album 2 if you’ve ever seen it? 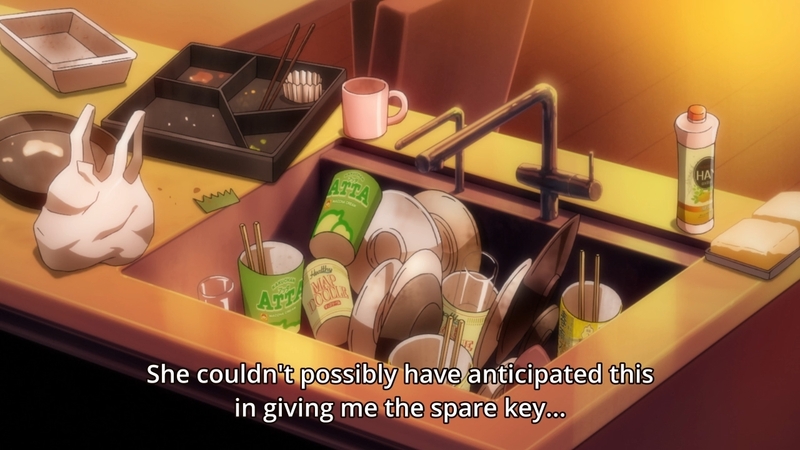 >After school, the hero gets a spare key to his girlfriend’s place in order to check up on Nodoka. Mai still can’t do it herself. Yay, now she’s immature as well! It’s almost like it’s hard to face a person when you said you hate each other’s guts in complete seriousness less than 24 hours ago, who woulda think. simple access to the internet is something he doesn’t want to participate in after everything that happened with his sister. At some point his sister needs to grow up or get help for her issues. Him just going cold turkey on a ubiquitous modern utility indefinitely is not a solution. His house has a phone. She has called him in the past and she could’ve done it again. Takes five mins. You don’t have to tell the therapist that you swapped bodies. Just talk about your issues. What’s weider? Seeing a professional or depending on a teenage boy to help sort out your sister’s problems whom he’s never met? I was living in Iraq while we were at war with America so pretty much all situations most characters in fiction go through sound like cake to me, that doesn’t mean they’re not well written or thought out. My point is that it is literally not well written to me. Them being petty through the eyes of other people is inevitable, but it’s equally as petty to complain about them being bad plot points. Here’s the thought process: 1) I can’t empathize with Nodoka, 2) I try to figure out why I can’t empathize with Nodoka, 3) I write a post describing honestly why I don’t. If you find that petty, I guess we just don’t see eye to eye. It’s almost as if I’m being flippant because I’m annoyed with the show. Well that’s why the rest of this series exists! I forgot about that, but again, she was still busy figuring out how to deal with this situation. It’s useless arguing about something that was never mentioned or presented though, so whatever. If you don’t find it well written, that’s fair. But that particular phrasing of “It’s bad because I think she has it better than most people” irked me. The example with your girlfriend leaving you is especially pretty dumb. A lot of great stories are influenced by an author’s personal experiences along those lines. You didn’t answer my question about white album 2 so I assume you haven’t seen it. But that particular phrasing of “It’s bad because I think she has it better than most people” irked me. That’s not what I said. I especially pointed out that people’s problems are valid no matter how small they are. Nevertheless, just because someone has a problem doesn’t mean it’s an interesting story to tell. If you disagree, fine.